Kristof Lauwers first studied classical guitar with Ida Polck and then experimental composition with dr. Godfried-Willem Raes at the Ghent Royal Conservatory. He specialized in electroacoustic music, music with live electronics and algorithmic composition. Currently he is working at the Logos Foundation, a centre for experimental music in Ghent, where he collaborates to the development of <GMT>, a programming language designed for real-time algorithmic and interactive musical applications. He is also responsible for Logos Foundations concert programming. He is also a member of the Logos Robot Orchestra, where he has the possibility to work with cutting edge technology like a complete robot orchestra, radar and sonar movement sensors and a polyphonic pitch detection device. This allows a completely new composition paradigm, abandoning the traditional linear score concept. Most compositions he writes for the robot orchestra are real-time interactive pieces, computer programs that make musical decisions dependent on the actions of musicians or dancers that play/dance live together with the orchestra. Next to his work with the robots; he also creates electroacoustic / ambient music and chamber music with live electronics, mostly using open source software like Pure Data and <GMT>. 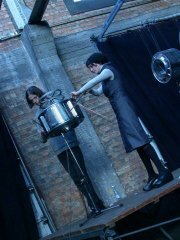 Together with Laura Maes and Leen Gyselinck he created the audiovisual piece ‘Kitch’n Glitch’ and the installation ‘WhirlWash’. With Nan-Ping Chan and Yvan Vander Sanden he created the multimediaperformance ‘C0de‘. Withe Maja Jantar he created the project ‘Glaer’, where Jantar’s voice is transormed electronically, using a Theremin as controller. He received composition commisions by Muzikon (Ghent university college) and Transit festival. His music can regulary be heard in and around Flanders, but has also been played on festivals in the Netherlands, France, Poland, Switzerland, Germany and Portugal.